The list of Love's Labour's Lost characters provide a convenient introduction to the William Shakespeare play summary of Love's Labour's Lost. The male and female characters bring the plot of the play to life. Not only do we remember the stories but we remember the people - we all have our favourite characters. The following short summary of Love's Labour's Lost provides a brief description of this famous William Shakespeare play. 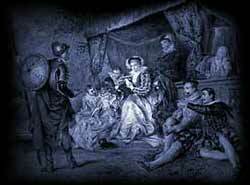 The story of the plot with its famous characters via the summary of Love's Labour's Lost. Interesting facts and information about the Globe Theatre of Elizabethan London with a William Shakespeare Play Summary of Love's Labour's Lost with a list of Characters. This drama is one of the great comedy plays by William Shakespeare. The Princess of France with her ladies Rosaline, Maria and Katherine tell the men wooing them (Ferdinand the King of Navarre, Biron, Longaville and Dumain) that they must wait and undergo tests to prove that their love is not just infatuation. King Ferdinand and his compatriots decide to isolate themselves for three years to study great books vowing that they will keep no company with women during this time. However, when more lovely women arrive on a diplomatic mission, the men fail to keep their oaths. The ladies discover the situation and the men realise that they truly love the ladies. The ladies banish the men to a hermitage for a further year before they will associate with them. The play therefore ends with no weddings, a surprising conclusion for an Elizabethan comedy. Interesting Facts and information about the Summary of Love's Labour's Lost and Characters. Additional details, facts and information about the Globe Theatre and the summary and characters of other William Shakespeare plays can be accessed via the Globe Theatre Sitemap.